At this point, you've assessed your ICD-10 readiness, downloaded your ICD-10 Success Checklist, and done some budgeting and financial planning for the ICD-10 transition. Now it is time to get into the nitty gritty of ICD-10 coding and documentation. Your first step in this process is to identify your top codes. Then, you'll map those top ICD-9 codes to their ICD-10 equivalents. This process is probably easier than you think. Your practice management and billing software should provide the ability to run a top codes report so you don't have to do this manually. Depending on your specialty the number of codes will vary. For a practice that uses the same handful of codes over and over again like Pediatrics there may only by 20 or 30 top codes. However, for a complex practice like orthopedics, there could easily be 100 commonly used codes. You can purchase top codes lists from sources like AAPC, but keep in mind these are generic to your specialty and may not reflect all of your most commonly used codes. If you choose to purchase a top codes mapping tool, you should still run your own report as well and cross-reference those with the list to see if any of your codes are missing. A top codes and mapping tool can help you do the mapping portion as well because they provide the equivalent ICD-10 codes. Your practice management and billing software or EHR might also provide a code mapping tool. 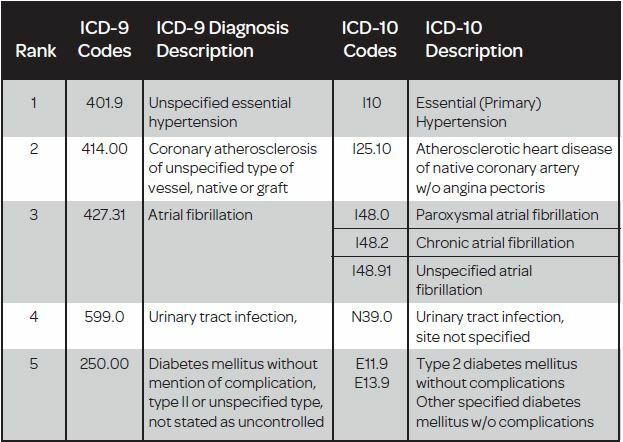 All of these options are helpful in mapping your top codes but you will still need to look up the ICD-10 codes in the ICD-10 Manual. The manual provides the detail about the documentation requirements for those codes. This is additional valuable information providers will need to document to the correct level of specificity so the encounter can be coded and billed accurately. You might consider creating a spreadsheet with top ICD-9 codes, the ICD-10 equivalents, and then a section for notes about documentation requirements. Think of it as a cheat sheet that providers can start using now to help with changes to documentation ahead of time. Watch for our next ICD-10 post on documentation improvement. To get more tools and resources on ICD-10 now, visit the Kareo ICD-10 Resource Center.